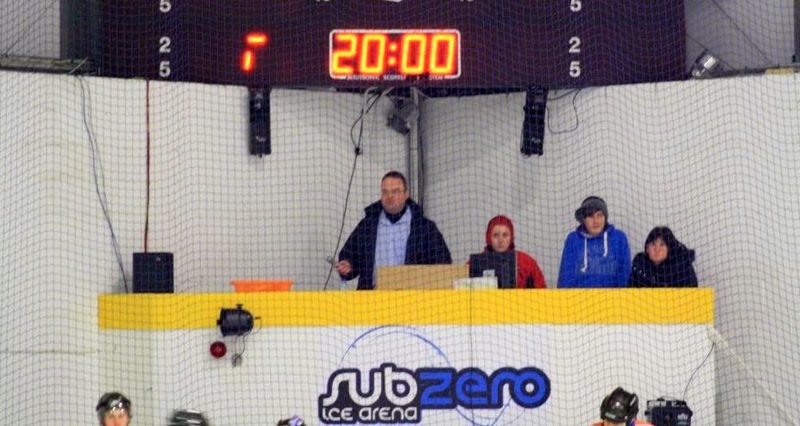 Blackburn Hawks have had a tremendous season winning their first ever league title and following it up with their second play off crown in recent years so it was quite fitting that this achievement coincided with their 25th Anniversary. A special 25th Anniversary “Legends” game was arranged and I thought this would be a great opportunity to have my first view of the current double winning team that I have reported about all season - and also to see some old faces from the past. 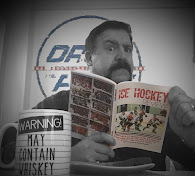 I ought to just point out here that, while I have watched Blackburn Hawks / Blackhawks on and off since the early 1990s, I am more of a general hockey fan than a partisan follower – even more so now that I am editor of the Ice Hockey Review NIHL yearbook and website where a sense of impartiality is very important. As such, most of the legends who came to play in this special game were well known to me, although for the most part this was due to their involvement with other teams and not necessarily their time spent at Blackburn. I have to admit that the main reason I wanted to come to the game was to see Steve Moria play once again. I have always had a bit of a love /hate relationship with Moria as he has always played for the team opposing the one I was supporting so, while you could appreciate his skill on the ice, you hated the fact that he always had such an impact on the game. League and also saw him playing for Cardiff Devils numerous times in those halcyon days. I actually spotted him down at the Blackburn rink during the 1992 close-season before he was officially unveiled as the new Player Coach so could have scooped the rest of the ice hockey media had I had the resources available to me then that I have now….! When he finally hung up his skates aged 51 in 2012 after over 1000 senior games in British hockey, I thought that was it so I was really pleased to see Steve coming out of retirement for this game. It was also nice to see Neil Abel play again – long time Fife Flyer and early Sheffield Steeler – and also ageless Jim Pennycook – who - like Moria - played internationally for the Team GB senior team, as did Bobby Haig who was at the Hawks’ helm for 9 seasons and helped guide them through some pretty choppy waters. Jon Cotton, Mark Johnson and Paul Hannant I all knew from when they played for Peterborough Pirates and then the Altrincham guys Ged Smith (former Nottingham Panther), Pete Winstanley, Ian Hough and Simon Mills who I particularly remember from the season I helped out with the Aces at Devonshire Road. 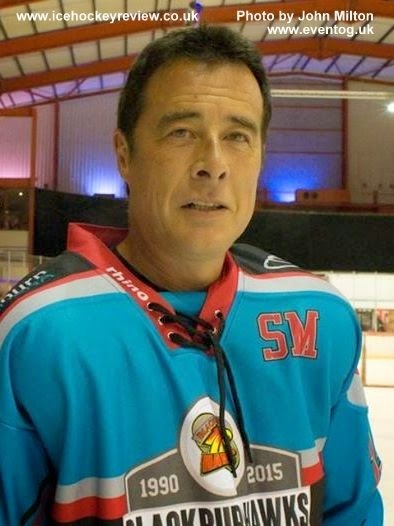 In addition to Jim Pennycook, Gary Shearman and John Dunford – both English League North winners with the Blackpool Seagulls – make up a trio of players who all played at the first ever British Championship play-off weekend at Streatham in 1982 so we had players covering the whole of modern day British ice hockey history from the late 70s right up to date all on the ice at the same time! The Hawks team also some former players as guests – so it was a wonderfully emotive and nostalgic occasion all round and was it especially nice to see the choice of referee Les Heighway – who I also knew from Altrincham Aces home games where he often officiated alongside his wife Rose (RIP). As far as the actual game is concerned it is rather difficult to write a proper match report because it wasn’t really a competitive game in the true sense of the word. We had a play fight midway through the first period and a pantomime penalty shot in the second. Players switched sides at each break and, by the end, we had most of the Hawks players playing for the Legends and most of the Legends playing for the Hawks –which makes the goals and assists rather bizarre reading to say the least. 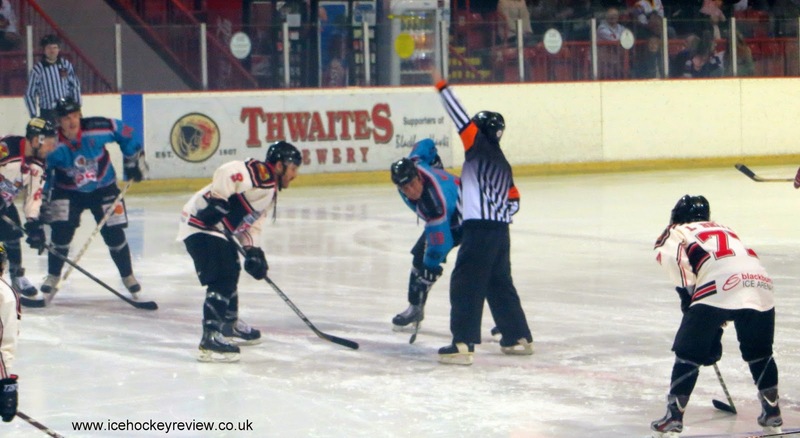 At one point, Gary Shearman was credited with a goal while later admitting that he wasn’t even on the ice at the time! Hawks’ new Coach Dan Mackriel had an amusing stint in the net while netminder Daniel Brittle played up front and scored a goal! 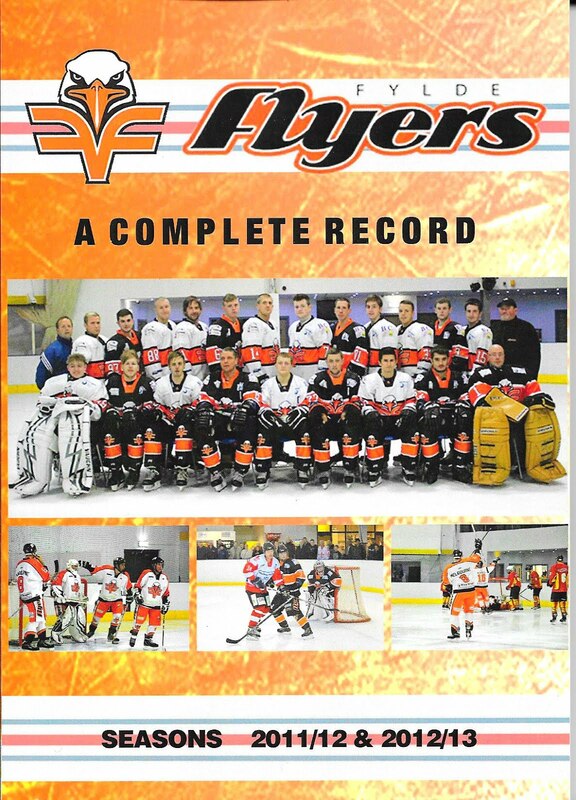 The Blackburn Hawks 25th Anniversary legends game will be featured in the 2015 edition of the Ice Hockey Review NIHL yearbook which will also include details of the Hawks' historic double winning season with photos, player stats and reports. 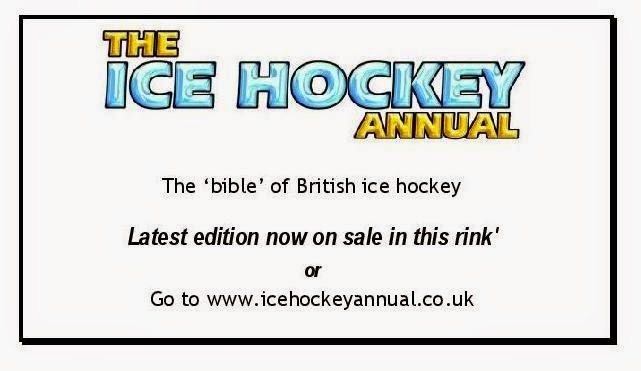 With full league by league and team by team rounds up for every club in NIHL North and South Divisions 1 and 2, this is the only publication on the planet that covers the NIHL in this much detail. Copies will be available to buy from your normal outlet in October or you can save money with the special "earlybird" offer by reserving your copy now at last year's price. 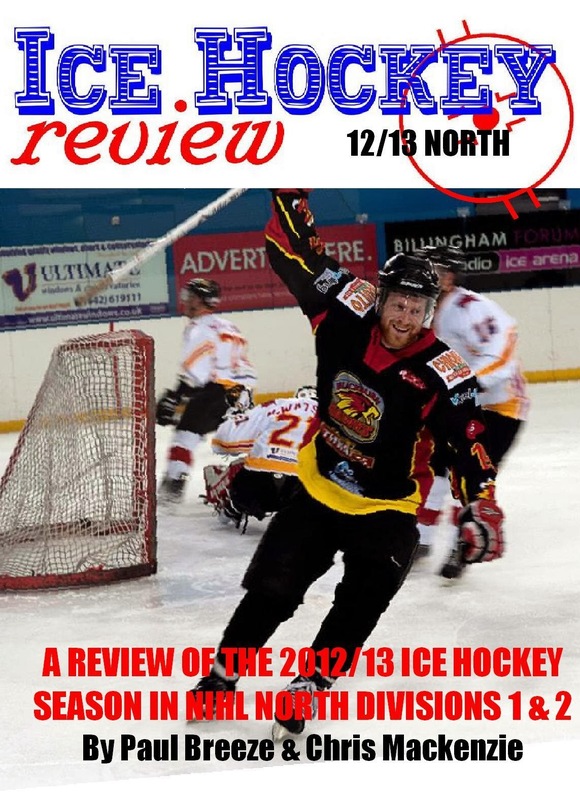 To make sure you are among the first to receive your copy of the Ice Hockey Review 2015 NIHL Yearbook, click HERE to see the order link.